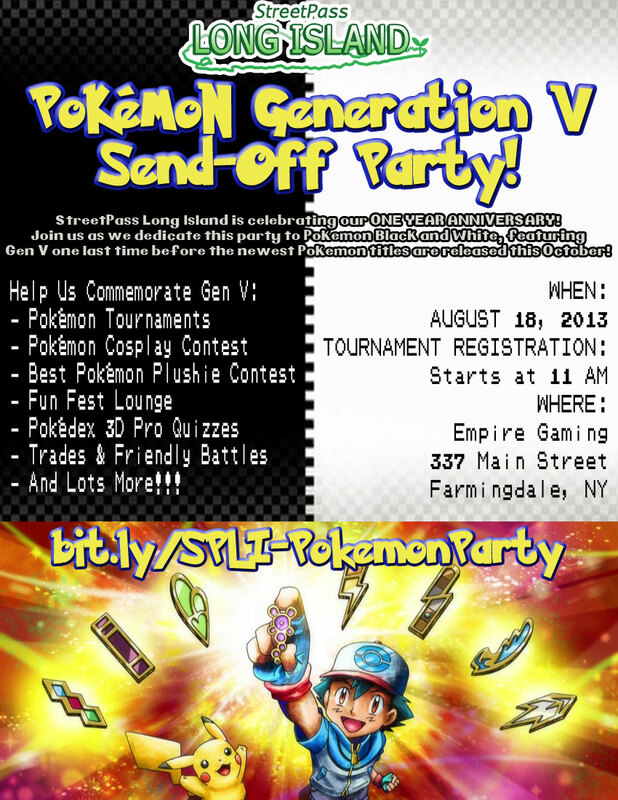 SPLI Anniversary Party & Pokemon Gen V Send-Off! TIME: Registration for the Tournament starts at 11AM. Full schedule of events to follow. StreetPass Long Island is celebrating our First Anniversary! Join us as we host a party to honor this accomplishment, as well as to give Pokemon Generation V a proper send-off before the latest games, Pokemon X & Y are released! ~ Pokedex 3D Pro Quizzes… and more! MORE DETAILS TO COME!! Check back soon! – We suggest all competitors bring their own DS compatible console (DS, DS Lite, DSi, DSi XL, 3ds, 3ds XL). 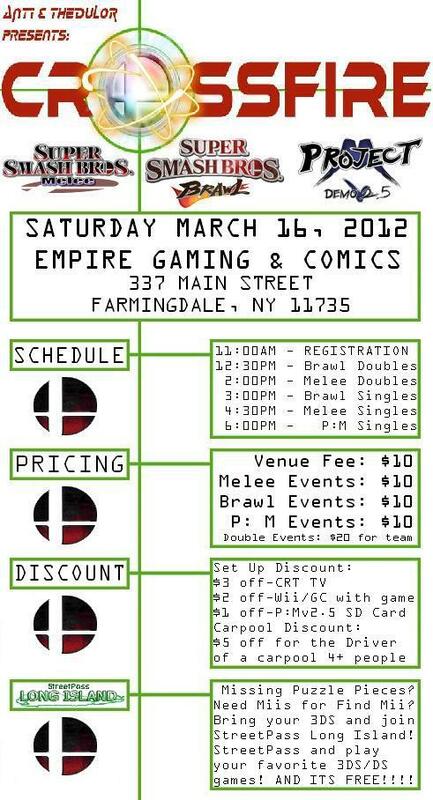 Come down to Empire Gaming & Comics (337 Main Street, Farmingdale) for CROSSFIRE! CROSSFIRE is a new Super Smash Bros Tournament Series ran by SPLI Admin theDuL0R and, top Brawl player, ANTi! There will be a separate Street Pass event that will be FREE for anyone just coming to hang out and street pass with the group! All pricing (venue fee and tournament fees) are for only those who will be participating in the tournaments!! So if you are just there to hang out and get some puzzle pieces, or you’re trying to defeat those nasty enemies on Find Mii…you can come and hang out for free!! !